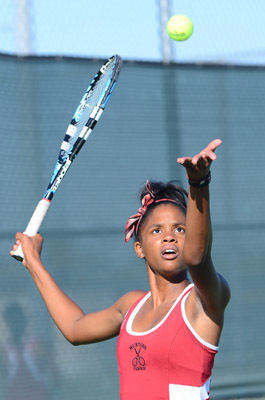 Each day Cierra White walks onto Western’s tennis courts, she realizes her team has little chance to win. Yet it hasn’t stopped White from shining as a singles player and trying to make the Warriors competitive as a squad. 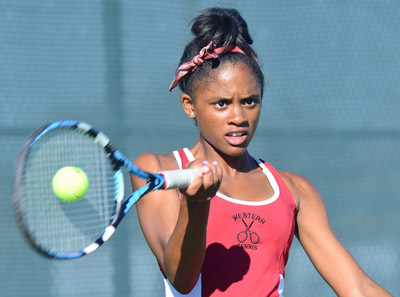 A senior, White has overcome a late introduction to the game and blossomed into a contender for the Division I-A Sunset League singles championship and a berth in the state meet next month. She has done so despite the Warriors having won one match all year — and that was by forfeit. Western struggles to field the necessary six players to avoid forfeiting matches. The Warriors have yet to fill a starting lineup of nine. “If I don’t come, then people think if Cierra’s not coming, why should we come?” White said. She does far more than just show up, though. With most of Western’s roster comprised of players who are new to the game, White spends almost as much time at practices giving pointers to her teammates as she does working on her game. It’s easy for White to relate to the younger players. She only started playing tennis in May 2010 and nearly quit before she got going. White stopped playing baseball after eight years but was told by her father that she needed to find another activity. “He told me I couldn’t just be in the house,” she said. “He told me to go do tennis because they had a free clinic, and I actually still go to the free clinic at Lorenzi (Park) every Sunday. Three weeks later, she changed her mind. Last season, White won two matches in the Class 4A Sunset Region tournament before falling to eventual region runner-up Victoire Saperstein of Palo Verde. With the creation of a Division I-A tournament this year, players have more opportunities to advance to state. 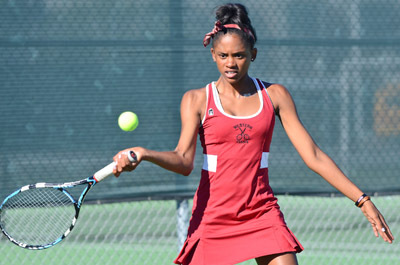 In all, five girls singles players from the two Division I-A Southern leagues will advance to the state tournament. White, though, insists she’s not a lock. Or maybe look where she could be. White, who is an honors student at Northwest Tech but is zoned to play at Western, is hoping to continue playing when she goes to college next year. “Give her a year or two more years, and she’s going to be super successful at the college level,” Nelson said.